Total Bozo Magazine: You Cannot Steer the Roomba. The Roomba Steers You. There is no Roomba. 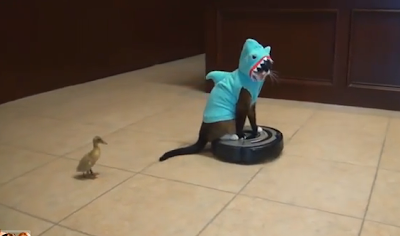 You Cannot Steer the Roomba. The Roomba Steers You. There is no Roomba. Do you remember The Matrix? Okay. Well it's probably been a long time since you've seen the movie(s), but you probably remember them loosely, like the plot points or whatever. I haven't seen them in a very long time, but there's a part in the very first Matrix film that I think of very often. Sometimes I will make reference to it in casual conversation, or in internet interactions, and people are always like "we don't know." Loosely explained: There was a part in the first Matrix where Keanu Reeves is waiting in The Oracle's living room to speak with her, and he's surrounded by a bunch of children doing weird things that are meant to imply to the viewer that they are special in some way. One of the kids is holding a silver spoon, which he is casually looking at, and by looking at it in this casual way, causing it to bend as though it were not a spoon, but a wet noodle. Keanu is watching the kid do this and then he's like "how do you do that?" And the kid is like "there is no spoon." This is how I handle stress. By looking at it in a casual way, and then being like "there is no stress." But guess what? The Matrix is a lie. That spoon is a lie. And Keanu Reeves is a lie. There IS stress. There's a lot of it. I have adopted, and made small tweaks to, the life philosophy that if you tell yourself everything is okay, it is. Bills coming due but you have no money? I'm sure you'll find some money in the street, it'll be fine. Weird pain in your body? It will go away eventually, or maybe whatever hurts will just rot and fall off, and then there you go. Recently told someone you know well, or don't know too well to go commit suicide? They'll forget about it sooner than later, and if they don't, just avoid them. I'm sure you've probably already seen this video, because you live on the internet, and we all live on the internet, but what I need you to know about this video is that THIS is life. THIS is the Matrix. This video. We are that cat, but we don't feel like a cat, we feel like a floating shark. We can feel that we are in an outfit, but we can't see it, and don't know why. We don't know what the outfit means, but we know we're wanted to wear it, so we do, and it seems okay. We don't have control over our bodies, but we are moving. We are moving in a smooth, in-consistent, but consistent because of that, pattern, and although we are constantly moving, we never get anywhere. We sense that if we were to get off what we are moving around in/on, something bad would happen, so we stay. We see things go by as we go by, but they are out of our grasp, unless we smack into them, and usually the things we smack into would not be our first pick. We are comfortable in our routine, and appreciative of the seemingly positive attention we are receiving, but secretly grapple with feelings of shame. And there is that duck. There is always that duck. Think about it. There is no spoon.